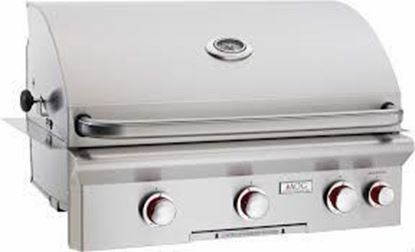 Built-in barbeque, American Outdoor Grill, Built-In BBQ Grill, AOG. 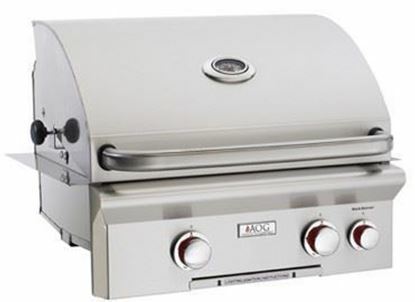 American Outdoor Grill 24" L-Series Stainless Steel Built In Grill w/Rotisserie and Halogen Lights. 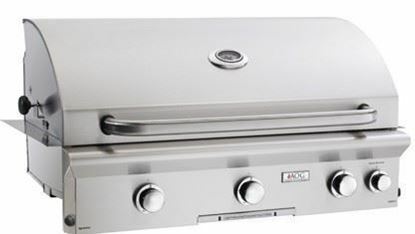 American Outdoor Grill 24" T-Series Stainless Steel Built In Grill w/Rotisserie. The "L" series grills feature an electronic push button ignition system that does not require batteries. It also includes interior halogen lights (controled by a push button located on the right side of the unit) ideal for night grilling. Requires 120 Volt AC power. The "T" series grills feature a push-to-light piezo ignition system that eliminates the need for electricity or batteries. This results in a self sufficient grill with a clean looking front panel. Built-in barbeque.